...these adorable Letter Soaps from Jonny's Sister. I stumbled across the site whilst browsing the internet one day & loved the concept. I think they'd make very cute gifts or welcome soaps placed in a guest bathroom & the scope for spelling out messages is infinite. Jonny's Sister kindly sent me a soap to try, thoughtfully choosing to send my initial. The soap arrived presented in a gift box and I can honestly say that I was impressed with the quality. There's the option of a glycerin or vanilla & poppyseed soap- I tried the latter and they lather beautifully with a creamy texture and delicate scent. 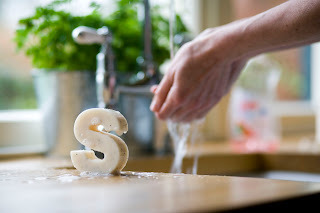 At £5.99 each, you may prefer to spell out a nickname than a long message but given that the soaps are handmade in the UK using the finest natural ingredients, I'd happily spend my cash with Jonny's Sister, particularly as it means supporting a small business.